Available now for HCS2018 Event DVD!! show guest introductions, depth showcase and impressions from before, during and after. Born Free 10 "Best in Show"
Born Free 10 "Invited Builder 1st Place"
Born Free 10　" Best Knucklehead "
Vintage Technologies / Hawke Lawshe' - 1946 HD Knucklehead "HADES"
Born Free 10 "Best Shovelhead"
Fast Eddy Co. / Chris Graves - 1975 HD Shovelhead "Hush Your Mouth"
Born Free 10 "Best Paint"
Vintage Dreams / Ryan Grossman - 1954 HD Panhead "Baddd Hunny"
chabott Engineering / Shinya Kimura - 1978 / 2018 Yamaha SR "Crystal Trophy"
Roland Sands Design / Roland Sands - 1934 BMW R7 "9T Concept R7"
There are also Pre-party (Little Get Together Party) as well as after party. Event coverage of cars & bikes, vendors, bands and more. There are also scenes that can only be seen because it is MOONEYES. People who came to the event, people who couldn't come to the event must see it! 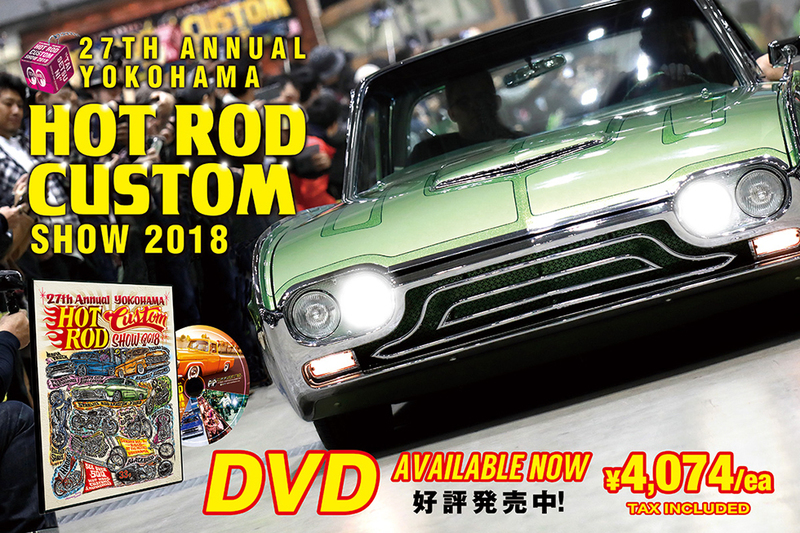 YOKOHAMA HOT ROD CUSTOM SHOW 2018 Event Report is HERE!! If you check it with the DVD, it will be more enjoyable!! 32nd Annual MOONEYES Street Car Nationals® Event Report!